It was nonetheless a priest, Fr. Marie-Alain Couturier, O.P. (1897-1954), who cleared the way for Le Corbusier to design the Monastery of Sainte-Marie-de-La-Tourette (1957-60) for the Dominican community at Eveux-sur-L’Abresle outside Lyon, in France. Like many Catholics, Fr. Couturier placed great importance on the incarnational nature of Christianity and the role that art and architecture played in understanding the sacred. By contrast, Le Corbusier concentrated his efforts on redefining artistic standards by glorifying industrial forms and promoting deterministic belief in the advancement of civilization. 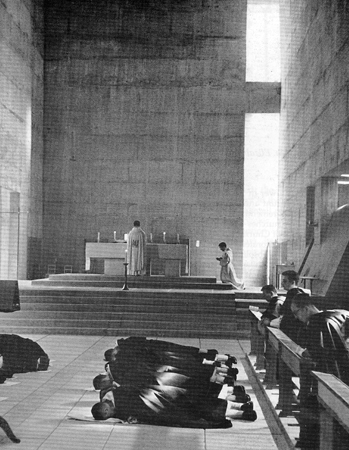 Consensus among Le Corbusier scholars reveals that he “had no place for institutionalized religion within his ideal society.” Nonetheless, Couturier’s philosophy of art and his personal friendship with Le Corbusier made the architect the obvious choice to design a monastery rooted first in modernist art, secondarily in religion. By mistaking the “spirit of the age,” or Zeitgeist, for the Holy Spirit, Couturier assisted in the production of structures by famous modernist architects at the expense of the essential features of Catholic artistic work. Couturier sought to renew sacred art and architecture in much the same way Le Corbusier sought to renew architecture: through the utilization of powerful contemporary forms and materials. Couturier remained disappointed in much nineteenth and twentieth-century church art in which pallid, sentimental images were copied and recopied. As a remedy, Couturier placed his trust in artists, believing that all true art revealed something of the sacred. Since true art could only be revealed by true artists, he therefore sought the services of the masters of his time, Catholic or not, to reach the sacred through the production of a supposedly “true” art. Born in Montbrison, France, Couturier intended a career as an artist from an early age. Called away to the First World War before he could study formally. Couturier returned to painting and drawing after being wounded in battle in 1916. He presented his first watercolor show in 1918, then left for Paris to study in the Atelier d’Art Sacré of the Academie de la Grand Chaumière. Under the tutelage of artists Maurice Denis and Georges Desvalliers, Couturier learned the arts of fresco and stained glass before joining the Dominican Order as a candidate for the priesthood. Soon after his 1930 ordination, Couturier began his life-long quest to improve the sacred art of the Catholic Church. After founding a journal of Christian art entitled L’Art Sacré Couturier penned numerous articles critiquing the state of church art, suggesting a new approach to ecclesiastical commissions. In order to reverse the trend toward insipid sacred art, the Church would need to readjust its understanding of its role as art patron in the larger society. It could no longer simply rely on the safe artistic formulas of the past being reproduced in mass quantities. Instead, the greatest artistic masters of the day should be put to work in the service of the Church, with or without reference to their personal artistic and religious philosophies. A forceful writer, Couturier enhanced his arguments with powerful juxtapositions of photographs. In a 1951 article in L’Art Sacré entitled “Sacred Art and Its Public,” Couturier presented two images. The first, a powerful late Romanesque Christ, slightly abstracted and full of expressive emotion, he labeled “What the Church gave the people in the ages of faith.” This he compared with two prayer card images. One illustrated a saccharine child Jesus embracing his girlish and pretty mother. The other showed a distorted Christ hovering over an illuminated Blessed Sacrament. He labeled the images “That which one finds in the pages of prayer books …” Couturier chose exaggerated examples to make his point, but a clear message emerged: trite, sentimental and overly prettified art must be replaced with “living art” composed of strong bold forms which could renew religious fervor through true revelation of the sacred. The idea was not new; traditional artists and architects had been making similar claims for decades. However, most sought to revitalize art within the context of recognizable Catholic tradition and philosophy. With his determinist belief in the advancement of civilization, Couturier saw art of the past as less relevant to the modern age than something produced according to the specific conditions of the twentieth century. He therefore chose a more radical break and favored more avant-garde artists. We knew very well that some of the artists were not strictly Christians; that some were separated from us by serious divergences of a political as well as of an intellectual order. Trusting in Providence, we told ourselves that a great artist is always a great spiritual being, each in his own manner. Couturier’s trust in “Providence” was in actuality his trust in whatever art his “masters” gave him. He was willing to accept the inherent relativism of the individual interpretation of not only their art, but also their personal understanding of “spiritual,” each in their “own manner.” For Couturier, “excellence and artistic sincerity were … to come before faith and piety,” and therefore he commissioned artists and let them determine the artistic outcome. The question arises: did these artists disposed to “spiritual intuitions” make their work appropriate for sacred use by molding their inspiration to the requirements made by an intellectually and spiritually demanding Catholic standard? Or did Couturier trust in their artistic abilities to the detriment of authentic Catholicism? Since Couturier placed faith in the spiritual intuition of great artists, he asked his friend the highly regarded architect Le Corbusier to design a new Dominican monastery. The principles which organized Le Corbusier’s belief system were those of rationality and industry rather than those of Catholicism. “Le Corbusier’s ideas began and ended with the concept that industrial society had an inherent form, an objective order derived from the nature of man and the nature of machines, an ideal structure, which - if realized - would bring prosperity, harmony, and joy. . . . For Le Corbusier, any industrial society must be centrally located, hierarchically organized, administered from above, with the most responsible people in the most responsible position.” A monastery project therefore spoke to certain of Le Corbusier’s interests in housing projects: a functional program, monastic cells, and the Dominican Rule, which he could view in its more mechanistic regularity. I am not a churchgoer myself, but one thing I do know is that every man has the religious consciousness of belonging to a greater mankind, to a greater or lesser degree, but in the end he is part of it. Into my work I bring so much effusion and intense inner life that it becomes something almost religious. Le Corbusier’s allusion to the “inner life,” while highly personal, apparently satisfied Couturier. From his early years, Le Corbusier had written of things spiritual, though in wide divergence from Catholic understanding. He claimed in Towards a New Architecture that the modern world needed a “spiritual revolution,” and he called for a “revision of values” and the ‘”mass-production spirit.” The concrete grain silos and coal bins pictured in the book replaced church steeples as symbols of the new age. Nonetheless, Couturier employed Le Corbusier’s “almost religious” architecture as medium for a community with religion at its core. Le Corbusier, then, by his own admission, could not let himself build a church per se. La Tourette had other offerings to interest him: monastic cells which he could equate with his theories on worker housing, and a prime natural site. Le Corbusier was therefore able to filter out the Catholicism and build Couturier’s monastery. In the face of this project I had to struggle against my atheism rooted in ancient civilizations and, having been an orthodox Christian, against the “schismatic” reflexes buried in my psychic unconscious. As a matter of fact I felt suited to create as if I were a believer, since I had escaped twofold from religion - from the ancient religion with which I had been impregnated as well as from Christianity. I possessed the necessary critical distance. I designed a high altar that was judged by the monks to be too abrupt, too high, too separative. In fact I had conceived it a little like a place for terrible sacrifices. It was too dramatic, too Aztec. Christ sacrificed himself, as did Dionysos, but the drama had to remain internal and luminous. Liturgical art must have the sacred character revealed by true artists, and be separate and distinct from other types of art. Latin served as a language distinct and separate from the modern world, and therefore remained associated with things reserved for sacred use. However, Couturier’s acceptance of the “modern” use of abstract concrete brutalism meant that he abandoned several of the most readable markers of sacredness: high status materials, fine craftsmanship, and an engagement with history and symbol. Le Corbusier’s desire to glorify industrial materials meant that Couturier would have to abandon much of the traditional semiotics of sacredness. 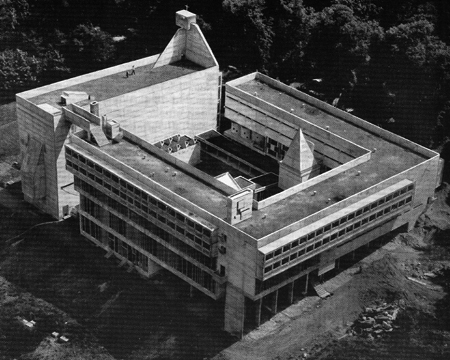 The design for La Tourette took shape late in 1953, after several months of joint planning between Le Corbusier and Couturier. The parti or concept is based on an adapted cloister, with the chapel pulled away from the other three sides, accentuated as “other” and therefore sacred. La Tourette sits as an object in the hills, starkly gray and geometric among the lush and steeply sloping site. Its dramatic siting and contrast to the surrounding environment can be read as an attempt to emphasize the building’s separateness, and by Couturier’s standards, its sacredness. In another sense, though, the siting of the complex depended upon Corbusian thought, particularly his emphasis upon the role of transportation in determining the form of cities and buildings in them. Just as Le Corbusier had argued for new city planning practices because of the mobility afforded by the automobile, so Couturier placed La Tourette in the hills, dependent upon automobile access, and apart from the city where Dominicans have traditionally built their communities. The interior of the large chapel displays the architect’s attempt to fulfill Couturier’s request for a renewal of sacred architecture. While grand and imposing, the interior is devoid of associations with traditional iconography and architecture. The large gray box was meant to focus the attention of the friars on the altar, which in its isolation and position atop many steps, retains something of Xenakis’ Aztec sensibility. Unlike traditional stained glass, the clear glass windows served no didactic function, and were established according to the scientific and rational criteria praised by Le Corbusier. Xenakis himself admitted that the fenestration was determined according to the readings of a light meter held inside the finished building. Holes were then cut in the walls as needed. The La Tourette project formed just such an occasion for Le Corbusier’s “occasional” desire to look beyond himself into the unknown. What he neglected though, with Couturier’s encouragement, was the known character of things beyond him as revealed through the Church and expressed in recognizable symbolism, history and iconography. La Tourette garnered much attention as a visual representation of the new artistic impulses of the Church, yet it offers little to promote relevance of the Church in the modern age. The indictment stings all the more since it was Couturier’s stated goal to establish and amplify that relevance. This failure is not Le Corbusier’s, for it was never his intention to embody Catholicism in his work or make it relevant to twentieth-century society. Both he and Xenakis remained frank about this matter. Le Corbusier’s architectural designs came within the bounds of the aspirations he set for himself; he desired to produce a dramatic building on an imposing site and work through issues he personally felt important. Promoting the claims of the Church was not his aim, nor was it achieved. 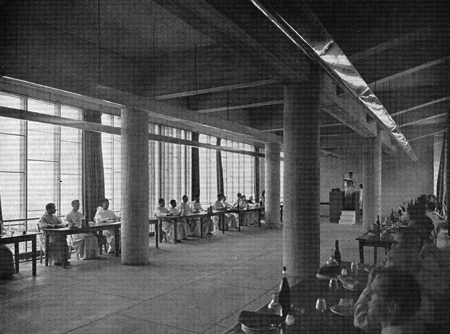 It was Couturier’s responsibility to make La Tourette suitable for a religious community. Catholic teaching, heavily dependent upon both its own traditions and Tradition as conveyor of truth, could not blend with Couturier’s philosophy. Lost in Couturier’s aesthetic are the artistic complexities of imagery, intellectual content, and architectural continuities that raise a building above the mundane and often support personal piety. Although Couturier found himself in an age which necessitated a reform of Church art, his method did violence to Christian tradition. It also placed too great a trust in modernist architects who did not necessarily aspire to hold their art to the standards needed by the Church. While Couturier lamented that the Church had gained nothing from modern painters like Manet, Degas and Chagall, he did not consider that their art and philosophies might not be compatible with the Christian faith. In short, Couturier sought to use the heroes of a worldview in opposition to his own in order to advance his own artistic agenda. For their art to serve his aims, he had to surrender important elements of the Faith he claimed to profess. From all indications, Couturier was a sort of determinist, believing that the correct expression was the modem expression. He adopted the Hegelian model of history in which artistic change comes about through an unknown collective force, but he equated the ever-shifting and inherently secular Zeitgeist with inspiration of the Holy Spirit. The Zeitgeist and the Heiliger Geist did not always agree. I have not experienced the miracle of faith, but I have often known the miracle of inexpressible space, the apotheosis of plastic emotion. This limited understanding of the spiritual satisfied Couturier’s immediate needs. His professed mission was to advance the Church by infusing its artistic creations with the true sense of the sacred, and there is no need to doubt his sincere intention. However, his method and philosophy can be better seen in the light of passing time, and can clearly be found wanting. Sacred art and architecture must use the means at its disposal to amplify the teaching of the Church and inspire piety and holiness through what Sacrosanctum Concilium called “signs and symbols of heavenly realities.” This was more than Le Corbusier was willing to give and more than Couturier was willing to demand. The Monastery of La Tourette was the result. Denis R. McNamara is Associate Director and Associate Professor at the Liturgical Institute of Mundelein Seminary in the Archdiocese of Chicago. He is the author of Heavenly City: The Architectural Tradition of Catholic Chicago and Catholic Church Architecture and the Spirit of the Liturgy. 1. 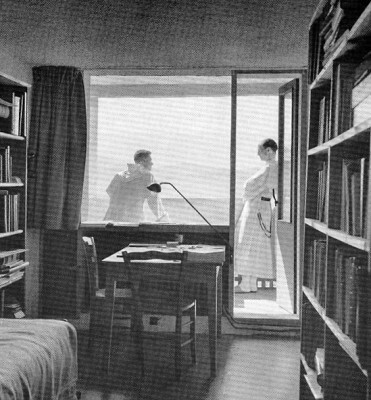 Le Corbusier, Towards A New Architecture (London: J. Rodker, 1931, reprinted Dover, 1986), 138. 2. Joanna Weber, “Couturier’s Vision,” exhibition essay, Yale Institute of Sacred Music, Worship, and the Arts, New Haven, 1986. Unless otherwise noted, biographical information on Couturier comes from this source. 3. Martin Purdy, “Le Corbusier and the Theological Program,” The Open Hand, Essays on Le Corbusier (Cambridge: MIT Press, 1986), 289. 4. Marie-Alain Couturier, “L’Art Sacre et Son Public,” L’Art Sacre (January-February, 1951), re- printed in Dominique de Menil, ed., Art Sacre (Houston: Menil Foundation, 1983), 59-63. 5. Marie-Alain Couturier, O.P., “A Modern French Church in the Alps,” Harper’s Bazaar 81 (December 1947), 122. 7. Joanna Weber, “The Sacred in Art: Introducing Father Marie-Alain Couturier’s Aesthetic,” Worship 69 (May 1995), 246. 9. Marie-Alain Couturier, L’Art Sacre, Assy 1-2 (September-October 1950): 17-18, as cited in Weber, “Couturier’s Vision,” 12. 10. During Couturier’s activity in the 1950s, the Dominicans of France were embattled in a struggle of will and theology with the French bishops and the Vatican. Criticizing the Dominicans for their political actions and theological writings, which contradicted the teachings of the Church, the Vatican’s Cardinal Pizzardo in October of 1953 sent the Master General of the Dominican Order a letter: “You know well the new ideas and tendencies, not only exaggerated, but even erroneous, that are developing in the realms of theology, canon law and society . . . this deplorable state of affairs cannot help but preoccupy the Holy See when it considers that the religious orders are forces upon which the church can and must depend in a special way in its struggle against the enemies of truth.” This not unfounded suspicion of French “modernity” extended to the work of non-traditional artists like Couturier, whose work could be associated with these movements. See Thomas O’Meara, “‘Raid on the Dominicans: The Repression of 1954,” America 170 (February 5,1994), 8-16. 11. Robert Fishman, “Le Corbusier’s Plans and Politics, 1928-1942,” Open Hand, Essays on Le Corbusier, 287. 13. Le Corbusier, Towards. . ., 6. 14. Le Corbusier to Louis Secretan, July 1961, archives of the Bibliotheque de La Chaux-de-Fonds, cited in Purdy, 291. 16. Iannis Xenakis, “The Monastery of La Tourette,” The Garland Essays (Princeton, NJ: Princeton University Press, 1987. 21. Anton Henze, La Tourette, The Le Corbusier Monastery (New York: George Wittenborn, 1966), 19. 22. “Fortress of Faith,” Architectural Forum, 113 (October 1960), 131. 23. Couturier, “A Modern Church. . . .,” 121- 122. 24. In 1961, soon after the monastery’s opening, Colin Rowe specifically asked readers to compare La Tourette with concrete grain silos illustrated in Towards a New Architecture. 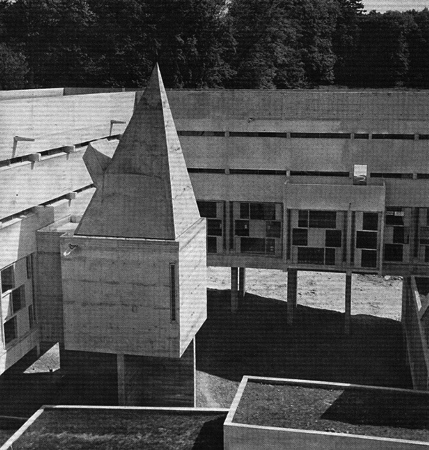 See Rowe, “Dominican Monastery of La Tourette, Eveux-sur-Arbresle, Lyons,” Architectural Review 129 (June 1961): 401-410. 26. Purdy, 292, citing Jean Petit, Corbusier, lui-meme (Geneva, 1970), 128.